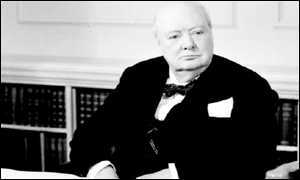 Wartime leader Sir Winston Churchill was the greatest prime minister of the 20th Century, according to a BBC survey. The Conservative, whose leadership and speeches inspired the UK through the Second World War, beat the last Liberal prime minister David Lloyd George into second place. Churchill's successor, Labour's Clement Attlee, was voted third greatest. Twenty prominent historians, politicians and commentators were asked by BBC Radio 4's The Westminster Hour to rank the 19 prime ministers from Lord Salisbury at the turn of the century through to John Major in the 1990s. Britain's current leader Tony Blair was not included because his spell in Downing Street is not complete. The programme announcing the results of the poll was being broadcast on Boxing Day on Radio 4. Andrew Rawnsley was asking five of the "voters" to have their say - political heavyweights Roy Jenkins, Barbara Castle and Kenneth Baker; and the historians Professor Ben Pimlott and Andrew Roberts. Winston Churchill led Britain during the Second World War after returning from the political wilderness. He lost the first election after the war but returned as a peacetime prime minister in the fifties. David Lloyd George took over as PM at the height of the First World War, replacing another contender, Herbert Henry Asquith. Her successor, John Major, whose premiership was blighted by Tory infighting over Europe, fared badly, rated 17th out of 19. Only Neville Chamberlain (18th) and Sir Anthony Eden (19th) did worse. Who do you think was the greatest? Send us your views using the form below. Here is what you have said so far. The best 20th Century Prime Minister is Clement Attlee for the foundation of the welfare state, still a model of welfare worth preserving. The previous Liberal model proved woefully inadequate as Beveridge found, and the free market left to it's own devices will provide neither security nor choice for the majority. This was evident to the Liberals almost a century ago. Margaret Thatcher is unquestionably the worst 20th Century Prime Minister. Not just for her appalling record in government - the massive wealth distribution from poor to rich, the battering of workplace rights, the attacks on health and welfare provision etc. - but more insidiously for her poisonous political legacy. Thatcher has so mesmerised Labour that they see no alternative to actively supporting such disasterous Thatcherite measures as the privatisation of the health service through Public Private Partnerships, the impoverishment of pensioners and the preservation of massive and increasing inequality! The result being that we will continue to pay a heavy price for Thatcher for many years to come. Two of the rankings excite particular surprise: the high placing of Herbert Asquith and the relatively low placing of Margaret Thatcher. Mr Asquith's overall record should not, I think, justify him being placed in the top ten, let alone the top five. Many of the 'reforms' which occured during his Administration were the work of men other than him. If Mr Asquith is ranked too highly, then, Mrs Thatcher is, surely, ranked too low. Whatever one's personal views about Mrs Thatcher, her impact - both politically and otherwise - on the life of the nation was, and continues to be, profound, much more so than any of the other Prime Ministers of the century, including Mr Churchill during his 1955-55 occupation of the Premiership. She should, therefore, be ranked second in the list and if one were to judge on their peacetime record alone, Mrs Thatcher would have to be ranked first. Atlee and Aquith deserve equal credit as PM of the 20th century for their achievements in the Welfare State. Thatcher was a dictator who led Britain into two of the worst recessions this century, and was reelected due to patriotism, a lack of opposition and the greed of society. I fully agree with Major's position - although Blair inherited a healthy economy, most of the benefits were a result of Britain pulling out of the ERM. Major spent billions trying to maintain our position within it. Churchill, without doubt. He had the greatness to take risks, and dared to be wrong (which he was, often). But he had a hatred for tyranny that drove him throughout life, and fought it in every way he knew, and without compromise. He may have upset the working classes in the 1920's, but he preserved their freedom to detest him. Churchill and then Thatcher without a doubt! These two PM's are known the world over for their strength and leadership and are the envy of many of the global electorate. Maggie is still in demand for public speaking all over the world. Some may not have liked the heavy hand that these two displayed, but look at the results! Though I did not agree with all the changes Thatcher made I would be inclined to vote for her as she was the most courageous PM in my opinion. She changed so much and introduced many unpopular polices and therefore it takes someone who is extra special to win three general elections. She was also the first female leader of the Tory party. For me, Churchill was by far the greatest PM this century but John Major has been sadly underrated. He not only left the economy in a good state but also kept a difficult and rabble Conservative Party together in spite of many problems left after its decline in the later years of Thatcherism. She herself was brilliant at the beginning of her reign but declined sadly towards the end - tending towards a dictatorship. In hindsight, perhaps it would have been better had she had left earlier and allowed someone else to continue for a few years. She could then have come back into active mainstream politics with fresh ideas and perhaps renewed popularity. Brian B. Warren, England, U.K.
Having read Time Magazine's essays on the person of the century (Winston Churchill did not figure in the top three, but his relationship with Franklin Delano Roosevelt was praised), it is gratifying to see that history seems to paying him the compliment he deserves. I must say that John Major has been done a great injustice by your poll, and would ask that he be given a fairer hearing. His economic policies may have led to some problems initially, but the UK survived better than most during the world-wide recession, bounced back quicker than most - and I believe is still the best all-round economy - and should continue to be. History will be the final judge. There really needed to be two categories- best peacetime and best wartime prime minister. There is no doubt, Sir Winston saved the nation and the world, in their hour of need against nazi tyranny- and Margaret Thatcher did the same- but this time the tyranny was from within and was not of such major significance. Nevertheless, In my view she will go down as the greatest peacetime prime minister ever. Churchill was a reactionary, war-obsessed and possibly xenophobic leader. He deserves none of the credit he receives, much of which stems from Britain's obsession with a small-minded and parochial nationalism that seems to engulf the nation whenever the world wars are mentioned. Thatcher, similarly, was a tyrant who ravaged this country and made it hospitable for the rich at the detriment of the poor. Atlee gets my vote. The welfare state was a noble principle and policy, and I find it abhorrent that successive Tory/New Labour governments have tried to dismantle it. I think it is significant that the judges chose two successful wartime leaders as the greatest prime ministers and two disastrous ones as the most insignificant. I have no quarrel with the choice of Churchill as No. 1, but Lloyd George is a totally different matter. His plotting against the generals and his abuse of the honours system do not appear to justify his place as No. 2. On the other hand, it must be remembered Chamberlain was a great social reformer, and though Anthony Eden's Suez campaign ended in shambles, had it been success, he would almost certainly be acclaimed today as the man who saw off militant nationalism in the region. The two greatest peacetime leaders were undoubtedly Attlee and Asquith, the one put in the shade today by his predecessor and the other by his successor. The greatest diplomatic triumphs were achieved by Heath and then again by Major in their negotiations in Europe. It should also be remembered the latter left the economy of the country in a remarkably healthy state. Not only was Churchill the greatest PM, he was probably the greatest American citizen ever. (Remember that he was awarded honorary American citizenship by Congress.) There may be many talented PMs on the list, but Churchill displayed leadership beyond talent -- he was alone, in the wilderness, crying out against the gathering Nazi storm, when most Brits would not even care to listen. Churchill was a giant who ensured that Britain would survive WWII, even if the Empire would not. No one else on the list could have provided that necessary leadership. No one. This says more about Radio 4 listeners than about the British population - the ordinary British public wouldn't have put a leader who wrecked the NHS, destroyed teachers moral and introduced the Poll Tax - 5th! She only won so many times because the opposition was in such a bad state in the 80s. Sir Winston Churchill and FDR were the two greatest leaders of the 20th century without a doubt. Their leadership took us to final victory. Today we see no such leadership in the free world! I am very surprised Thatcher placed as low as 5th. She was the one peacetime leader who challenged the prevailing orthodoxy, and against an incredible amount of opposition from the establishment revitalised the flagging UK economy and renewed our national self confidence. I can¿t see how Asquith, Atlee or Lloyd George measure up to this record - their actions were more a reflection of the general mood at the time they governed. The choice of Winston Churchill conveniently forgets his less than kind treatment of British people during the General Strike. Churchill, like Thatcher, was a rabid warmonger. Both displayed a cavalier contempt for human life. I would look more to the individuals who had to pick up the pieces after the glory boys had gone away. Atlee would make a far better choice as a man who had to pick up a shattered nation. Why else did the nation reject Churchill so convincingly after the war? Why did people riot in the streets against Thatcher? Real leaders inspire confidence and respect, not hatred and disgust. Winston Churchill was unquestionably the greatest PM of Great Britain during the last hundred years. Churchill deserves a "thank you" from every person on this earth who enjoys the greatness of freedom. During WWII, Sir Winston faced an enemy who had taken over most of Western Europe in one year. He faced a German air force numbering over 5,000 planes. Despite these drawbacks, Churchill led Britain with confidence through a dark period in time. Not only is Churchill the PM of the century, I believe he is the man of the century. Churchill is the clear choice. I do not believe there are enough words in the English language to describe this great man. He is not only the greatest PM but the person of the century. I do not understand Atlee's second place finish. There must have been a concerted effort by Labour to put someone high on the list so they chose the socialist with who was a good and decent man though a failure as PM. I vote for Clement Atlee. I lived and worked in Britain for most of the 1960s. I came to appreciate the nobility of the welfare state and do not join in the present denigration of that fine concept.The National Health service alone places Atlee at the top of the list. Sir Winston Churchill and Mrs Thatcher would have to share the honour. He was the man who did more than any other to save the civilised world from Nazi terror and she saved it from socialist bungling. Churchill is my choice. But for his courage and guts in 1940 resisting the strong pressures in his Cabinet for a negotiated truce with Hitler this country would have been occupied by German forces. I was a young man then and remember how Churchill's inspiring use of the English language reinforced our determination and strength. He was the most popular politician in the country. In 1945 the country rejected the Conservative Party, not Churchill himself who was returned with a handsome majority as MP for Woodford. I did admire Maggie in her hey days but Winston is my first choice. Winston Churchill would be my first choice followed by Margaret Thatcher. Churchill was a great war leader, without him I doubt we would enjoy the freedoms we take for granted. However reading historians and other colleagues of his in his second spell, I really think he should have quit after the war, he spoiled his record by being PM in the 50's. Even Ted Heath admits that his mind was still in the war, when he created himself Minister of Defence. My own personal choice would be Asquith, who virtually reformed the constitution and gave way for the first tentative steps for the welfare state. Without doubt Winston Churchill was the Prime Minister of the Century. No other Briton, PM or not, had a larger influence on British politics than Churchill, and no other Briton could have rallied, and ultimately saved, the country as Churchill did during those dark months in the summer of 1940. I disagree strongly with the notion that Winston Churchill was the greatest PM of the 20th century. He wasn't If he was he would have the general election immediately after the war, which was based on him being a successful war leader. My mother tells me of occasions in cinemas where Churchill would appear on newsreels and he would be booed by civilian and military cinema goers alike. His general election victory in the fifties was won under unusual circumstances, the Tories actually polled less votes than Labour. Churchill was never really popular with the people that mattered at that time, the electors. They saw what he was like, a vain and ambitious man who they never fully trusted. Churchill became more popular after his death than ever he was during life. Historians have made the basic mistake of associating a blustering drunken PM with the heroism of the civilian and military forces during that period. Without a doubt, Winston Churchill was the greatest PM of the 20th Century. He was a man before his time and knew Hitler was up to something long before anyone suspected Hitler. However, no one listened to Churchill and that was a mistake. Maggie has to be the best all round PM, she brought the UK kicking and screaming from the socialist backwater it was in the early 80's to a competitive Euro-player. Churchill was a PM for the wartime and a truly great man, but a wartime leader was his true calling. Margaret Thatcher hands down!!!!!!! Us Yanks have the likes of the Clintons, who have no dignity. You Brits can hold your heads high with leaders like Margaret. I think Major will be seen by history as a better PM than the participants in the discussion gave him credit for. I've never voted Conservative in my life and probably never will. However, Major left the Country with a considerable legacy of economic prosperity, and had a good record in holding his party together in the face of abject adversity. Europe moved on without the UK, but we continued to have the opportunity to take part in all EU activities via the Maastricht opt-out, bravely secured by JM despite having a minimal parliamentary majority and a very significant part of his party against it. Add to that an election victory no one expected, and with the highest number of votes for the Conservatives ever. I think you have a PM with the standing of at least a Heath, a Callaghan or a Wilson.